By VAR (USA) (1999 -Stud 2005), Champion Sprinter Europe, Champion Sprinter France. 7 wins, 1000 -1200m, Prix de l’Abbaye de Longchamp Gr.1, 2nd Dubai International Trophy Gr.3, TFR 124. Dam, 2 wins, 2nd Gran Criterium. 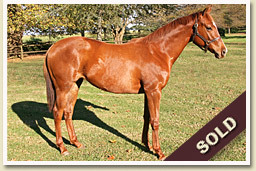 Grandam Half sister to Bonnie Blade (grandam of Champion WILD SPIRIT). Sire of 1st crop winners VILLANDRY, VACHERIN, ESTEREL, VAL DE RA, LOCHLORIEN, Valeta, August Rush, Enchanted, Bedouin, Vareuse, etc. Comment : Family of Emancipation 19 wins Australian Horse of the Year.